Volkswagen has a new commercial that I have already seen about 10 times and though I’m a fan of Dean Martin, I’m not a fan of this commercial. Back in the hippie days, a couple going at it in a VW bug may have made sense. But with this timeline, it doesn’t really go back more than 8 years or so and the couple portrayed don’t exactly seem like they’re counter-culture. Dad just seems to have a weird thing about procreating in very tight spaces – rockin’ away in the VW bug at first resulting in a trip to the dealership for a larger VW. The process repeats itself and the happy, growing family continue to have mom and dad go at in the confines of their car. It concludes with another VW rocking away – presumably VWs are very fertile places – only it shows the entire happy family inside the vehicle causing enough of a commotion that they’re causing the car to sway back and forth on its apparently not very sturdy frame. The commercial ends with the statement, “Life’s as big as you make it. Introducing the all new 7-seater Volkswagen Atlas.” Oh, I get it. This commercial is trying too hard. Personally, I find it kind of obnoxious, too. In-between all of the Viagra and Cialis commercials, I now get this couple that loves to breed in a bug. 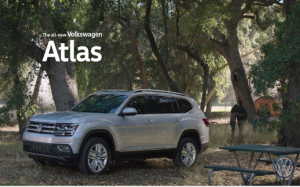 I’m not sure what the key selling points of the Volkswagen Atlas actually are. There are all kinds of vehicles that can seat 7 or more so that isn’t much of a sales pitch. To me, Volkswagen simply isn’t getting enough bang for their buck. And I certainly would never want to ride in the back seat of their vehicle. Visit BloodLines Creative on whatever device you have and hopefully you’ll enjoy the experience. Yes, it took a while. 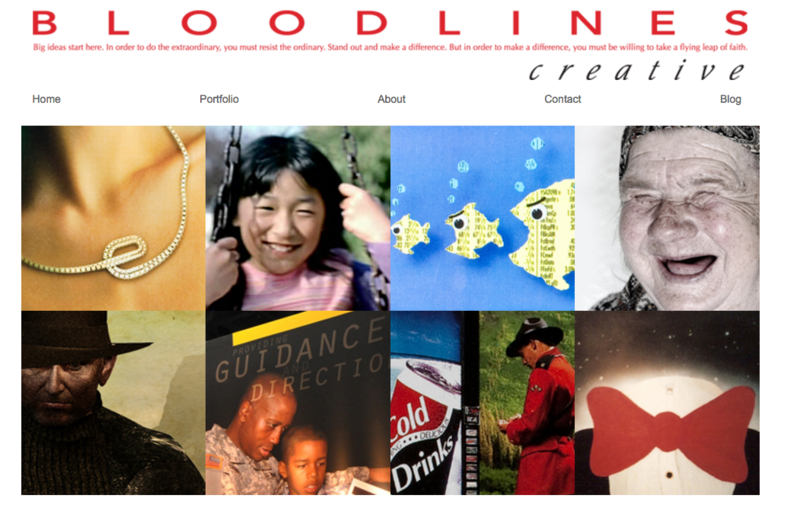 But BloodLinesCreative.com is finally a responsive website. So whether you visit on an iPad, your phone, a tablet or on a mac or pc, the site now adapts to the confines of the device. Yes, it should have been done some time ago. And yes, the site could use a refresh of new work that’s been done over the past year or so. That will come. In fact, the site still isn’t 100% fully functional – my broadcast reel still doesn’t play on mobile devices – but that should be addressed in the next week or so. I have fallen victim to what so many other advertising and marketing communications companies deal with all the time – it’s tough to manage your own marketing when you’re busy helping with the needs of the clients you serve. It’s been a busy start to the year. But in order to keep that momentum going, I need to ratchet up my own marketing efforts – and before I began that endeavor, I needed to get the website fully functional no matter how it was viewed. So I guess I need to wait a few more days until we get the broadcast section remedied for mobile viewing. 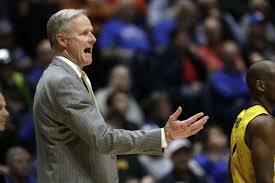 Tonight will probably be Kim Anderson’s last game on the sidelines for the Tigers. In what was one of the biggest surprises in early March Madness, the Missouri Tigers somehow managed to beat Auburn University last night in first round action of the SEC Tournament. I thought for sure that last night would have been Kim Anderson’s final game on the sidelines as the University of Missouri head basketball coach – but some ineptitude on Auburn’s part in dribbling the ball down the court and some improbable 3-point shots that actually went in for a change allowed the Tigers to prolong this train-wreck of a season for another night. I wasn’t thrilled when Kim was hired to replace Frank Haith. It just didn’t seem like a smart move to me even though he was a much-loved former Mizzou hoopster and had a strong alumni contingent pulling for him to get the coaching opportunity. Three seasons came and went and basketball at Mizzou has gone from bad to worse. Kim might have been an okay coach. He might even be a good coach. But as for recruiting, not so much. There are some pretty strong basketball players here in the state of Missouri. Most of them end up going somewhere other than Mizzou. And who can blame them? The program has been on its heels probably dating back to when they brought in Quinn Snyder. His teams managed to make the tournament quite often but there were multiple off-the-court incidents that led to his departure. Mike Anderson was a tough coach and his teams did well. But there were still underlying problems that led to potential NCAA violations so when his alma mater called, he was gone, leaving a few more potential investigations behind in his wake. Frank Haith didn’t do the program any favors, either, and he left the program in even greater disrepair. So Kim had a mess on his hands before a whistle was ever blown. Personally, I think his gruff demeanor and total by-the-rules coaching style didn’t jive too well with the players he inherited – so many of them left. And he couldn’t bring in the caliber of players needed to get the program back on its feet again. So tonight, (barring another March act of madness) will be Kim’s last hurrah. It was cool seeing him give Terrence Phillips what I thought was a final hug for both of them after Phillips had fouled out. It’s hard to judge the intangibles of what Kim does behind the scenes. Ultimately, in college sports, it’s all about wins and losses. And for that, Kim now owns the worst three losing seasons in Missouri college history. The only way the program can go, in theory at least, is up. I’m hoping this next coaching hire is the start. 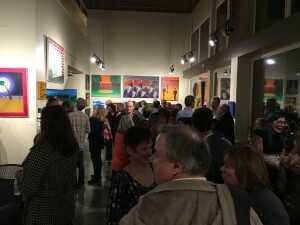 Just a few of the more than 200 friends, family members and work associates who attended opening night festivities at Blood On The Walls at 1900 Park. Last November, I learned that I’d be having my first gallery showing in more than 21 years. 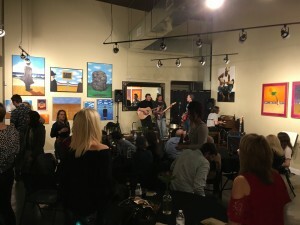 It would take place at 1900 Park – Creative Space and Gallery and would feature at least 30 of my modern art and surrealist paintings, accompanied by the music of Tom Jr. and friends. I was truly excited but March 3rd was a long time away back in early November. I began compiling a to-do list, starting with the overall invite. 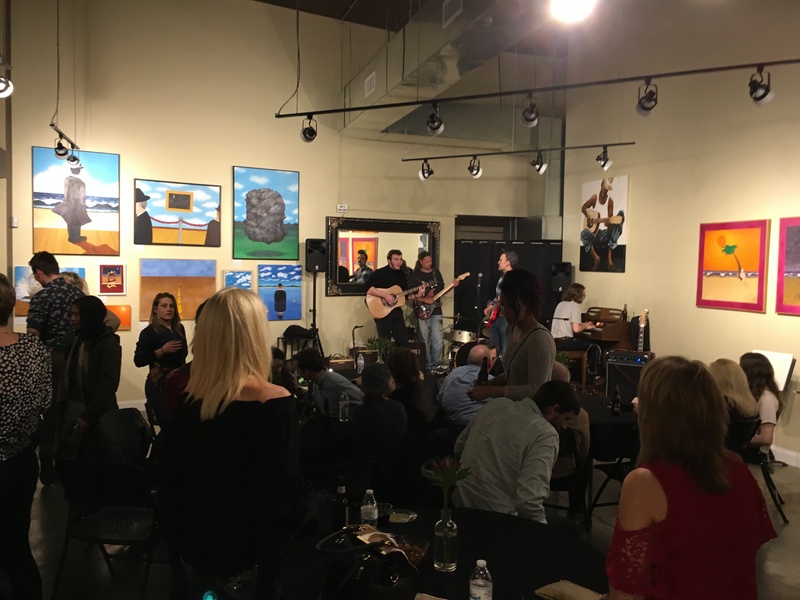 Initially, we were going to title the event “The Tom Blood Experience” – but since Tom was only playing for the opening night reception and because that title seemed a little self-serving to me, I opted instead for “Blood On The Walls”. It was simple. It was memorable. And it pretty much described what attendees would see – lots of paintings by Tom Blood, hanging on the walls. The holidays came and went. I developed the invite and then began pushing it out, setting up a Facebook event page as well as personally inviting friends, family members and work associates both past and present. Tom Jr. began his portion of the event as well, working with several of his musician friends to plan the evening’s musical entertainment. People began to RSVP, starting slow, but as of last week, the number eclipsed 200 and I was fairly confident, even with multiple no-shows, that we would have a great crowd on hand. Tom and I made the painting selections, narrowing the number of choices down from more than 50 to what I thought might be a too many number of 40. It turned out to be just right. I created explanations for each of the paintings, trying to give viewers a glimpse into my thought process behind the painting and I’m glad I did as I thoroughly enjoyed watching people read the captions, then look back up at the painting. It’s kind of unnerving when you see so many people staring at art that you created. But that’s why art exists – to be viewed and enjoyed and interpreted. It was so refreshing to unleash some of these paintings, getting them out of my basement and into a gallery. It felt like they belonged. The show officially got underway at 6:30. By that time, we already had more than 20 people wandering around. I was raffling off several items from my http://tom-blood.pixels.com site and the jars quickly began to fill. People kept pouring through the doors. Cousins. High-school and college buddies. People I’ve worked with through my many years in advertising. Fellow parishioners from St. Gerard-Majella. Tom drew his own crowd and it was such a cool mix of people. Tom and his musician friends made some magical melodies. I wanted to talk to everyone – which made my attention span almost gnat-like. Every time I’d be talking to someone, someone new would enter and tap me on the shoulder or give me a hug. At one point, I stepped off to the side and just gazed at the crowd. Though it wasn’t wall-to-wall people, it was crowded everywhere you looked. The band was jamming and I smiled to myself, knowing that, like all things, the evening would come and it would go. By the end of the evening, I had lost my voice. Already, I was looking back, wishing I would have made an appeal for people to toss in a few bucks for the great music that was played. I wish I could have personally thanked every single person who came, (though I certainly tried.) I wish I could do it all again and savor the joy and warmth and friendship and soak in all the many compliments I heard throughout the night. But the Opening Night Reception of Blood On The Walls is now in the past. And all I can do is press onward and keep painting to assure that the next event comes a little sooner than 21 years from now. Thanks to all who made this special night one for the memory books. To see some of Tom’s work, visit http://tom-blood.pixels.com – there, you can order prints or a wide variety of items featuring Tom’s artwork to turn ordinary items like iPhone cases or pillows or tote bags into conversation pieces.